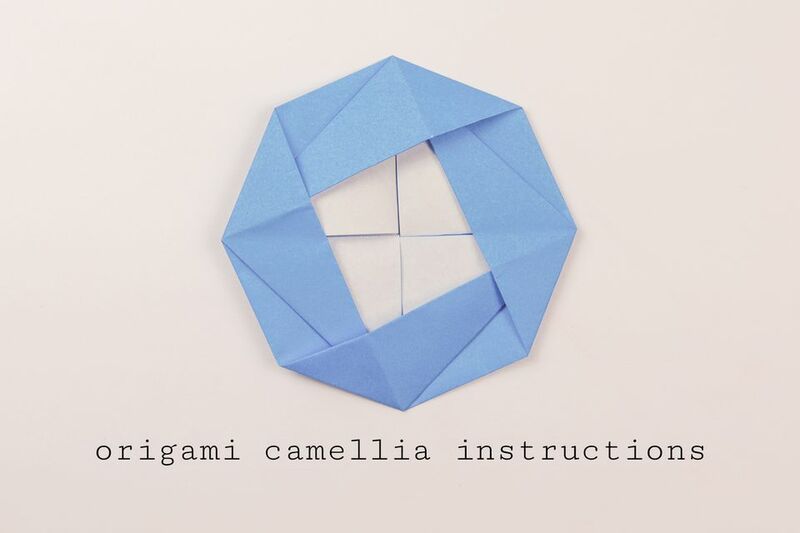 Learn how to make a pretty origami 'camellia' flower with these simple step by step instructions. The Japanese word for the camellia flower is "Tsubaki". Traditionally the red Tsubaki represents love, the white represents waiting and the yellow represents longing. This round flower makes a pretty brooch or decoration for many different crafts, you can add it to handmade greetings cards, on top of masu boxes, or make a 'Shikishi' or display of a garden scene. You will need one sheet of square paper, to start with we'd recommend using paper that is 15 x 15 cm. For some more origami flowers, check out the easy origami lotus tutorial or the origami lily. 1. Start with the paper white side up. 2. Fold the paper in half diagonally in both directions. 3. Fold the bottom left corner up diagonally to the central crease. 4. Fold the bottom right corner up to meet the central fold. 5. Open the front layer of the right section up and push it up. 6. The point should meet the diagonal flap underneath. 7. Fold the top right corner down diagonally to the central crease. 8. The same as step 5. Open the flap and push it back so that the point aligns with the flap underneath. 9. This is how it should look. 10. Fold the top left corner so that it meets the top right point. 11. Again open the flap and push it as shown. 12. This is the result. 13. Flip the latest flap upwards. 14. Unfold the lower left section. 15. Swap the flaps so that the lower left section rests on top of the left section. 16. This is the result. 17. Pus the lower left of the flap over and to the right. 18. Align the point with the right section. 19. Put the flap underneath the flap on the right. 20. Re-fold the flap on the top left and insert it into the lower section. If you had some trouble making this flower, don't worry, it can take a few attempts before you get it perfect, unfold the paper and start from the beginning or get another sheet of paper.